Two social apps based on audio have very similar names — but both are pretty bad. Two companies based in Illinois are duking it out over a really bad name for a social networking app. Eevzdrop, LLC (two e’s at beginning) has sued EvzDrop, Inc. (one e), saying the latter is infringing its Eevzdrop mark. Both names are a play on “eavesdrop”, as both companies offer social apps that involve audio. And both of the names miserably fail the “radio test”, meaning that someone who hears it aloud will have no clue how to spell it. Last month the defendant allegedly demonstrated its product at an event entitled “Technori Pitch” held in Chicago. Some people in the audience were familiar with the plaintiff and were apparently confused. It appears that the defendant may have gotten to market faster than the plaintiff, as the plaintiff’s app has not launched yet. 67. Plaintiff has at least one hundred eighty five (185) pre-registered consumers for its EEVZDROP App. 68. Defendant intentionally adopted the Plaintiff’s mark EEVZDROP knowing it was a nationally-recognized brand owned by Plaintiff. Calling yourself nationally recognized when you only have 185 pre-registrations seems like a bit of a stretch. Eevzdrop also claims that its eevzdrop.com is identical in sound, appearance, and meaning to Evzdrop’s domain name www.evzdrop.com. I suppose that’s correct — if you can pronounce either of these. What makes it confusing to me is that none of them own eavesdrop.com. Also confusing is that neither company appears to own the version of their names with an ‘s’ in place of the ‘z’. Multiple times writing this story I wrote the names as “EevsDrop” and “EvsDrop”. If I were either of these companies I’d drop the dispute and find a better name. Company files trademark lawsuit, demands lingerie company cease using domain name. Mothers Against Drunk Driving, known by its acronym MADD, is taking on lingerie company MADDSEXY in a trademark lawsuit (pdf). 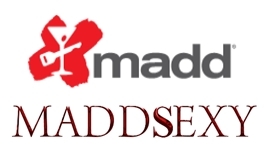 Among MADD’s requests is that MADDSEXY cease using its domain name Maddsexy.com. Defendants’ promotion of lingerie products, along with their highly sexualized portrayal of women in their promotion of their products, is likely to erode MADD’s credibility and damage MADD’s goodwill and valuable reputation by diluting the MADD Marks, including, but not limited to, the famous MADD mark. Hmm. I “get it”, but I can also understand how the lingerie company chose to add two d’s to the end of its name for a number of reasons. Defendants’ use of “MADDSEXY” in promoting women’s intimate products so resembles MADD’s distinctive marks used in connection with MADD’s goods and services, which are offered in the same channels of commerce to the same general public, as to be likely to cause confusion, or to cause mistake, or to deceive. I seriously doubt anyone who buys this lingerie thinks that a portion of the proceeds are going to Mothers Against Drunk Driving. Clothing company says you can’t use the term “gap” in your social media web site. Clothing company The Gap has sued GapNote.com and its founder for trademark infringement. GapNote.com is a new site that helps people chronicle their past, present, and future, and the gaps in between. The lawsuit claims that the site should not be able to use the term “gap” anywhere in its name because the clothing company owns rights to the domain name. Defendant promotes and operates a web site with the domain name gapnote.com that services as a social media and networking web page, much like those on which The Gap expends significant time, effort and money to advertise and maintain a significant presence. So The Gap apparently thinks that if you have a social media site that includes a generic, three letter term and a trademark holder markets itself on social media sites then you’re infringing its mark. The one thing I will give to The Gap on this is that the site’s logo does use a font similar to The Gap’s old lower case logo. (It now uses an all upper case logo.) Before reading the lawsuit I went to GapNote.com and thought “wow, that logo font is similar”, and assumed the lawsuit was about the logo. But it’s not — The Gap is claiming a lot more. You can read The Gap’s complaint here (pdf).